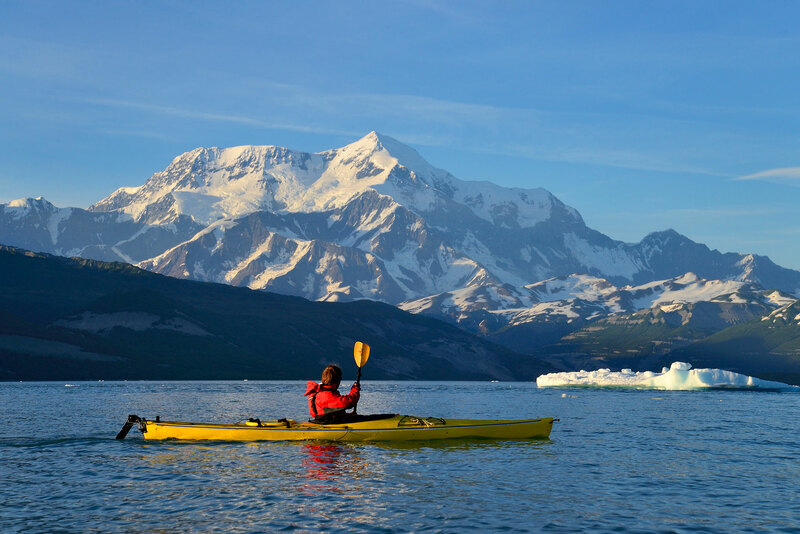 I’ll outline just some of the skills you’ll need to learn and the safety information you’ll wish to be familiar with for sea kayaking in Alaska. It’s helpful to revisit this stuff if you’re familiar with it, and go into a lot more detail if you’re setting out on your first trip. The main thing I can’t stress heavily enough is to go beyond simply learning this cognitively. Practice it and get it down. Someone in your group must have solid wilderness first aid knowledge, and a complete Basic Life Support kit. A guide should have Wilderness First Responder certification. Someone in your group should also have water safety and rescue competency. Everyone should paddle with a Personal Flotation Device (PFD). I highly recommend bringing some kind of communication device, be it a sat phone, a Spot, powerful 2-way radio. A whistle is a good tool for each paddler to have, as well. Have a short and long tow strap and quick release carabiner. Know what a buddy rescue is. Know how to get back in your boat, or get someone else back in their boat, in open water. Spent some time practicing these skills before your trip, or at the very least, the very beginning of your trip. For most people, hypothermia will be the biggest concern. Sea kayaking in Alaska means cold water and that = hypothermia. Tending to situations quickly is important, but not more important than being careful to not exacerbate the situation. #1 is prevention. #2 is prevent the situation getting worse. #3 is tend to the person in trouble. Knowing how to deal with cold situations and potential hypothermia is critical. Other environmental safety issues include icebergs and glaciers, wildlife, weather. Tidal in Alaska can be much larger than many other places, so be sure to camp and tie off your boats well above the high tide mark; don’t be slack on this issue. Icebergs can easily flip you over, so don’t get too close. Remember the bulk of the ice (90% of it) is under the water, so stay back. Glaciers calve and crash huge chunks of ice into the water. The calmest surface can quickly turn into a 5 foot tall wave if a towering chunk of ice crashes down. Wildlife can be anything from bears to moose to marine mammals like seals, sea lions and whales. be careful. Weather can change drastically, quickly, and it’s much better to be standing on dry ground waiting out a storm than sitting in your boat or swimming in open water waiting out a storm. Pay attention to what’s going on. It's Further Than You Think. Distances can be deceiving across water. Always check with your map and GPS rather than estimate how far it might be to XYZ. Double it if you’re paddling out and back. Sea kayaking safety also involves staying right side up in your kayak. You’re probably not going to learn to roll, or be able to roll, your sea kayak. If you already can you probably aren’t reading this article. Ideally a roll is something you should work on and learn. If you can’t roll, at least take some time to try and get somewhat comfortable and confident in your ability to stay calm when you flip over. Do this by having a few safe practice flips. Remember, the key above all else is to tuck forward your face towards the boat. NOT leaned backward over the back deck of your boat. Whether you roll or not, you want to be leaning curled forward over the front of your boat if you flip. In the short term, you should definitely be familiar with the techniques and practice for rescues. Self rescue and buddy rescues. Know how to do a wet exit. Know to keep a hold on your kayak (and paddle) once you come out of it.Know how to empty your kayak of water once you retrieve it and are ready to get back in. If you’re in open water, you can use your group’s boat/s to lift one end of the upturned kayak and drain it. You can break the suction by rolling the boat side to side. Self rescue, like all rescue, starts with prevention, so practice a low brace, and a high brace, and know how to use them. Learn, and try to practice, re-entry. Scramble on to your now rightside up boat from the back, not the side. Group dynamics are important; if someone in your group flips over, the absolute bottom rule for all backcountry safety is CYOAF .. Cover Your Own A$$ First. Do NOT make matters worse by rushing into a bad situation and end up with 2 people swimming. Always, always always assess the situation before involving yourself. One person out of 3 upside isn’t a disaster, but 2 out of 3 is 5 times worse .. and 3 out of 3 is a recipe for something to end badly. And my rule for rescue is (always) the rescuer is in command. The rescuer tells the person in trouble what to do, and makes all the rules. The person swimming, for example, doesn’t. If there are more than one rescuer, the person in trouble is at the bottom of the chain of command. And if a swimmer doesn’t do as you say, paddle away from them. Instruct the swimmer, clearly, what to do, and when. I also recommend you use someone’s name when you instruct them “Robbie, grab on to my rudder” is much better communication than “grab on to my rudder”. Have them grab the nose or tail of your boat, not the side of the kayak where they’re more likely to tip it over. Watch out for ships and boats, and stay out of their way. Let them have the right of way. These are just a few of the safety concerns you should pay attention to. If you’re inexperienced sea kayaker, definitely get some good practice in, and/or consider taking a guided trip. Often you’ll be out of earshot with your group. Learn basic signals to effectively communicate with one another. Point positive. In other words, pointing to your left means go left. You don’t point at things you want to avoid, but point in the direction you want to go. A paddle held vertically means ‘come to me’. Moving the paddle up and down, somewhat vigorously, tells the others to come faster. More for emergency situations, etc. Holding your paddle horizontally tells others to stop, and hold steady. “Go back” is signaled by waving your paddle blades up and down. There are a number of standard signals used by boaters, not just for sea kayaking – whitewater kayaking, canoeing, rafting, and so on. It’s best to learn these and use them rather than make up your own. But if this is a one time trip for you, just make sure your group members are ALL aware of what your signals means with each other. One of the simplest and most useful signals is simply asking if someone is OK. Point at the person, and tap the top of your head. If that person is OK, they should tap the top of their head in response. If not, wave your arms or paddle side to side. That’s a pretty universal sign of distress. And remember these signals can be used to communicate to rescuers or other people you may run into on your trip. People in a boat for example or on land. It’s FAR more effective than shouting. For overnight trips, whether it’s just a one night trip or a multi-day sea kayaking expedition, you’ll want to know wilderness camping, and camping in bear country protocols. You’ll want to know how to choose a good campsite in the kind of landscape you’ll likely be camping in, what the most likely potential hazards might be, and how best to avoid them. Storms are frequent here, and picking a campsite that won’t get flooded out, won’t get destroyed by strong winds, or flooded when the tides rise is critical. Know what a sheltered campsite is. Don’t camp on or close to animal paths. Know how to prepare your food, make and break camp, and keep your gear dry. Know how to, and have the requisite tools, to get a fire started. Bring all the requisite maps, keep them handy in a waterproof bag, and know how to read them. Have a good compass, and know how to use it; don’t just think you know how to use it. Definitely be aware of the angle of declination – in Alaska it can be 30 degrees or more, which can easily throw you off route. I also recommend satellite images you can print out from google earth or google images. Those can often be a better tool than a standard topo maps in the coastal regions. The key is , as with all equipment, know how to use it. Paddling in the fog is tough. Stick close to shorelines when possible, and be sure to stick close together as a group. In open water, try to make enough noise that any other boaters nearby will know to avoid you. Also, in open water crossings, it’s better to aim for land and then follow it one way or the other as needed, rather than aim to bypass the land and skirt a point or head. Good navigation is all about knowing where you are; not finding how to get back on route. Don’t wait until you’re lost, or even unsure, before you check your location. you don’t wait until your starving before you eat, or soaked to the bone before you put on a jacket; don’t wait until your lost before you look at your map. A GPS can be a great backup as well. Keep it dry, batteries charged, and know how to use it. Start with learning how to safely enter and exit your boat. The number one likelihood of ending up swimming is getting in or out of the kayak. Keep your weight low and centered over the boat. And take your time. Loading zones are where you get in and out of your sea kayak. Pick a good one. Calmer water, flat solid footing and good visibility are helpful. Don’t come ashore in the middle of crashing waves, or rocky headlands or areas where you can’t see 3’ from the water’s edge. If you must, holler first to warn any potential wildlife hazards you’re there, and then go in one person at a time. And be careful. But better to pick a better, safer loading zone. At the very least, you should know the most basic of paddling strokes, forward and reverse propulsion strokes. Know what a brace is. Know how to scull, what a sweep stroke is, and how to paddle efficiently. Sit up straight, use your torso for power, and relax. Know turning and steering strokes. The old adage that applies to virtually any activity is keep your eyes posted where you WANT to go. Don’t look at things you don’t want to run into. It’s just like riding a bike or driving your car. Download a trip packet and review information and details at your leisure. Another important thing to practice before you jet out across miles of deep, cold open water is the small stuff. Grabbing your water bottle from under your spray skirt or your rain jacket or camera. You’ll definitely want to keep somethings handy on top, but you can’t keep everything out of your boat. Even something as benign as lifting up a set of binoculars and looking through them (or a viewfinder of your camera) can radically alter your perception and balance. Be comfortable doing this before you head out across open water. Planning involves all the above and more. It involves considering your gear, your navigation and paddling skills, the type of trip you’re embarking on, where you’re going, things you’re likely to encounter, or not likely to encounter, and so on. I think this is one of the more important skills you’ll need and a process you’ll need to be very meticulous with for a sea kayaking trip. Have a good understanding of the route, even for a day trip. next, make sure you have multiple backup plans in place for when things don’t go as planned. Further, speak to your ferry captain or air taxi pilot and know as many options as you can for dropoff/pickup locations if you need to change plans. Find out all you can about local weather patterns, particularly winds and wind directions. Don’t ignore this. Similarly find out all you can about local tides and currents. Don’t ignore this either. Turnagin Arm, for example, is home to one of the most famous bore tides in the world. An inexperienced (or even experienced) sea kayaker caught unawares can have their trip completely ruined by something like this. If there are any public cabins in the area that might be available, or private cabins in use, at the very least be aware of them. In case of an emergency, knowledge of the nearest help can be the difference between things ending up OK and things not going so well. Lastly, before you change plans, take your time and consider all the possible outcomes carefully, then do it again. Too often plans changed in haste, under pressure and stressed situations, aren’t sound decisions. So replan carefully. Lastly – address all of the points here, and tend to your weakest areas first. If you’ve never sea kayaked before, and have little to no backcountry camping experience, not only should you consider a guided trip and a shorter trip like a daytrip or overnighter, go somewhere and get comfortable with being on the water in a kayak, even a whitewater kayak in a lake will make a difference. You’ll be SO much better in a kayak your 2nd or 3rd time around; or you might save yourself a great deal of time and expense and realize that kayaking really isn’t for you. And I recommend figuring that out before you leave home rather than half way across Prince William Sound. Ready For A Sea Kayak Trip? Think you’re ready for a great sea kayaking trip? Get in touch and we’ll see what we can work out this summer.